This Ketubah is not only inspired by the unique Art Deco style, but specifically the gorgeous architecture seen in the Chrysler Building. The clean lines and fading golds and whites recalls the classic imagery seen in the era of Art Deco, while the touches of emerald greens and unexpected designs adds life and color to this already gorgeous work of art. The Art Deco Emerald Ketubah is perfect for couples that not only love this completely original style, but are looking for something that is both simple and dynamic, clean and vibrant. The design of the this Ketubah not only reflects the genius and creativity put into creating something as gorgeous as the Chrysler building, but also reflects the couple's distinct taste and unique style, blended perfectly into the Ketubot tradition. Notes: The proportion of this Ketubah is different from others on our site. 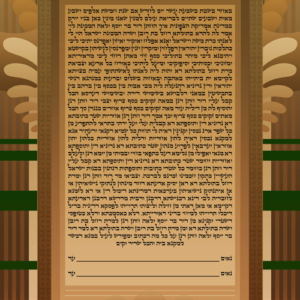 The Medium or Classic ketubah size, for this one, is 9.6×24 (instead of the usual 16×24); and the Large size -which we recomend- for this ketubah is 12×30 (instead of 20×30).